In September 2017, a photo went viral in social media circles. It showed a boy weeping near the body of his father who had died cleaning sewers without any protective gear. According to Rashtriya Garima Abhiyaan, around 600 people have died cleaning sewers and septic tanks in last one and half year alone; although the National Commission of Safai Karmacharis (NCSK) quotes the figure of 666 from 1993 to 2018 (according to a report on the portal The Wire). NCSK data also shows that one person dies every five days due to manual scavenging. One of the most common reasons for such deaths is the lack of safety gears and tools. The government has issued guidelines about how dangerous waste should be handled and cleaned, but no mechanism exists to effectively monitor the implementation of guidelines or ensure the guidelines are followed on the ground. Even today, unskilled men descending down the gutters in cities, towns and even in rural areas is a common sight. Private contractors employed for cleaning sewers frequently violate the guidelines, yet they are not held accountable. The present system of cleaning sewers through contractors or hiring safai karmacharis on ad-hoc basis is inefficient and troublesome for poor and migrant labourers who are not aware about dangerous gases emanating from manholes, such as Ammonia (NH3), Carbon Dioxide (CO2), Carbon Monoxide (CO), Hydrogen Sulfide (H2S), Methane (CH4), and Nitrogen Oxide (NOx). The most important aspects of the Act are the rehabilitation components such as a provision of scholarships for children of parents engaged in manual scavenging, one-time cash assistance (OTCA) of '40,000 and a provision of a residential plot with financial assistance to build a house. There is a provision of providing training and skill development for an adult member of the family with a stipend of '3,000. The Act also has a provision for loan to help workers take up alternative occupation. 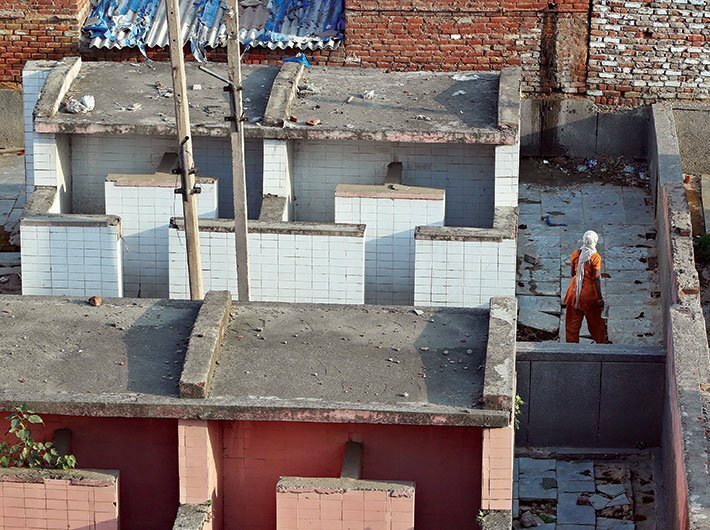 However, in 2017-18, only 1,072 people availed the benefit of OTCA provided under self-employment scheme for rehabilitation of manual scavengers (SRMS), implemented by National Safai Karmacharis Finance and Development Corporation (NSKFDC) (Annual Report, 2017-18). Latest data as reported in the sixth meeting of the Central Monitoring Committee under the MS Act shows that prior to conducting the National Survey of Manual Scavengers, 12,991 manual scavengers have been identified and are provided OTCA of Rs 40,000 each. This amount aggregates to Rs 51.96 crore up to July 31, 2018. Also, skill development training for 13,587 identified manual scavengers and their dependents have been sanctioned up to July 31, 2018. Furthermore, the subsidy has been released for 944 beneficiaries who have availed bank loans for self-employment projects. During the National Survey, 8,438 manual scavengers were identified and have been provided OTCA of Rs 40,000 each up to October 1, 2018. The current system has many drawbacks even if the provisions mentioned above are accounted. The MS Act permits manual scavenging with protective gears. But the term ‘protective gear’ is not defined in it. So, even simple rubber gloves can be counted as protective gear. This loophole has been exploited by contractors, resulting in the deaths of workers. This problem has become acute since there is no effective mechanism to monitor the implementation of guidelines. The Act provides for the appointment of state inspectors. These inspectors are supposed to examine the premise of latrines, persons employed as manual scavengers, and seizing relevant records. The National Commission for Safai Karmacharis (NCSK) is the body assigned to monitor implementation of the Act. NCSK is also responsible to inquire into contraventions of the Act. In spite of all these provisions on paper, the reality is poles apart from the expectations, as evident from the incidences of deaths of workers. States are also responsible to constitute vigilance committees and state-level monitoring committees. But as of October 2018, only 14 states have constituted monitoring committees. Also, only 13 have confirmed constitution of vigilance committees (Agenda notes, 6th meeting of Central Monitoring Committee under the MS Act). There is a need to set up an institution with trained professionals and adequate technology to tackle the problem of sewage and septic tank cleaning. The proposed institution should be constituted on the lines of fire/ambulance services. The administration of this service may be under city corporations, municipal administrations and district panchayats. The services may also have a medical section to handle emergencies on the cleaning site and medical supplies must be sent on the cleaning site. A vehicle fully equipped with tools, protective gears should be sent for site. The minimum medical supplies, minimum gear and minimum tools to be maintained should be exclusively specified during the constitution of the service itself. The word ‘minimum’ here does not indicate bare minimum. Enough precautions should also be taken while constituting the service to avoid exploitation of loopholes. The convoy should have at least one technician and one medical staff. A customer interface should be designed to book proposed service for a required date or time slot to avail this service. The booking facility should be available online and via phone booking. The service should be provided to both private and public institutions and individual homes. Since the proposed system is envisaged to function as an on-demand service, it is expected that it will start generating revenues after its gestation period. A mechanism to lodge complaints and resolve grievances of the public should be established. All the responsibilities of the NCSK should be subsumed under the proposed service. Also, all the related tasks like rehabilitation of workers, provisions for the children of safai karmacharis and compensation should be handled by the proposed service. The proposed service would be the sole body regarding monitoring, implementation of the Act and rehabilitation of the workers. The governments both at centre and states should make adequate provision for special funds to the local authorities till the service is regularised. Recruitment to these services should be open to all. The new service should assimilate all existing and identified sanitation workers and train them to handle new equipments. The proposed framework will make sure that the system to clean sewers is mechanised and regulated. It will ensure that the people employed are trained professionals as opposed to the present system of employing unskilled labour. It will also give an opportunity to people currently working as safai karmacharis to work in a better environment and upgrade their skills. This way, their safety can be ensured along with the quality of work done. Collaboration with industry is essential for this service to perform efficiently. Many Indian startups are working to find a solution to the problem of cleaning sewers. Recently, India SaniTech Forum showcased many technological solutions developed by Indian innovators. For example, ‘Bandicoot’, a robot designed to clean sewers and manholes, is already being tested by three municipal corporations of Kerala, Tamil Nadu and Andhra Pradesh, according to a report in The Wire. If implemented properly, the proposed system has the potential to be an ideal symbiosis between industrial innovation and public institutions. Building a new institution in the spirit of Clean India Mission is the need of the hour; this action would remove the gaps in shortage of skilled and equipped manpower for raising demands for cleaning manholes/toilet pits constructed on the clarion call of the prime minister. Dr Muniraju is deputy adviser, NITI Aayog. Pavagadhi and Pardhi are interns at the Aayog.